Our highly qualified and insured dog trainers can offer a bespoke obedience training service to suit the needs of you and your dog, including one-to-one correctional training for domestic dogs with behavioural issues. We have a no nonsense but caring approach in all of our training. Handling hundreds of dogs each year – whether it’s training our own pets and security dogs or working with them, rescuing strays for the local councils and re-homing or training dogs for others – we are able to specialise in understanding dog behaviour and where their aggression or dominance has come from, and their motivation to train whether drawn by praise play or food. 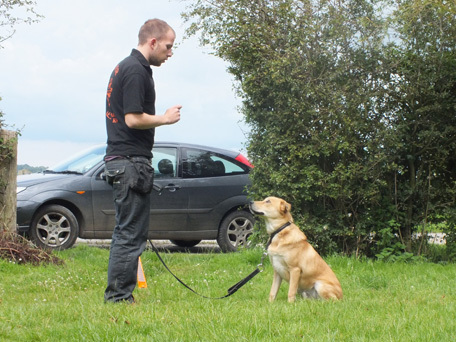 All our dog training courses are based at AlphaGuardK9 HQ in Sussex. Contact us on 0845 602 9197 or via our Contact Form to discuss your needs. Will my dog be hurt during behavioural training? No. We use our understanding of a dog’s behaviour and methods of communication to address obedience issues; discipline and direction are used without force. Please contact us to discuss course requirements and pricing.